Note that tracking rank is a little tricky when, as in the case of Scoble, the blog appears under a number of URLs and the content is also republished on a number of sites. 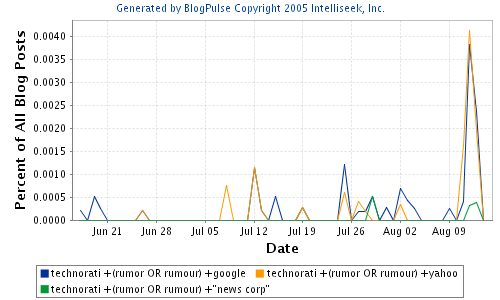 Of these bloggers, Rowse and Scoble generate the most interesting results as can be seen from these portions of the conversation (for more details on conversation tracking, please refer to the BlogPulse site). The high ranking of these bloggers makes them sources for information - other bloggers start referring to their posts on the rumour rather than the original post. 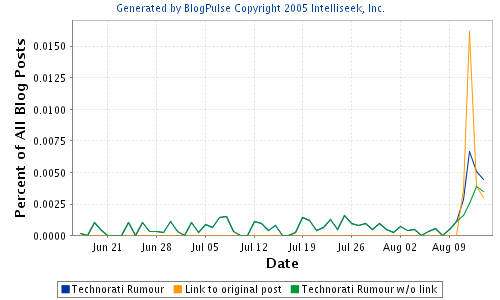 This type of pattern accounts for some of the posts we see in the trend graph which refer to the rumour but do not link back to the original Ochman post. To me, this is a microcosm of the blogosphere: memes start getting picked up due to their inherent interestingness (regardless of the rank/importance of the original poster). Once these stories hit highly ranked bloggers, they get amplified. There has been some discussion of late about the relevance and value of lists of top 100 bloggers as determined by citation count. Citation count (inlink count) is used as a proxy for influence. However, in observing events like this rumour, we can see that it is not just the count of inlinks that is important, but the function of the blogger. A blogger who amplifies a story is, fundamentally, more influential than a blogger that posts the original buzz-worthy article. In the later case, it is the meme itself which is being linked to. In the former, other bloggers link to the article amplifying the post because they regularly read and cite the influential blogger who has endorsed the story. Finally, the following trend graph suggests that speculation on the result of the story is a dead heat between Yahoo and Google.